Founded in 1868, Altoona was once just a small town on the prairie—at least until the planes, trains, and automobiles came. Trains started crossing this town as planes made their way to the Altoona Airport, and the construction of Interstate 80 on Altoona's north edge brought many tourists. The growing community has become known across the state as the "Entertainment Capital of Iowa." Altoona is home to Adventureland Park, Iowa's largest amusement park, as well as Prairie Meadows Racetrack and Casino, and it hosted the state's first municipal airport, Hanna Air Field. Various innovative individuals called this community home, such as Robert Townsend with his single-pass color printer and George Kurtzweil and his idea to grow the first acre of hybrid seed corn. Altoona's history espouses a unique combination of small-town Iowa traditions and progressive thinkers that make it unforgettable. 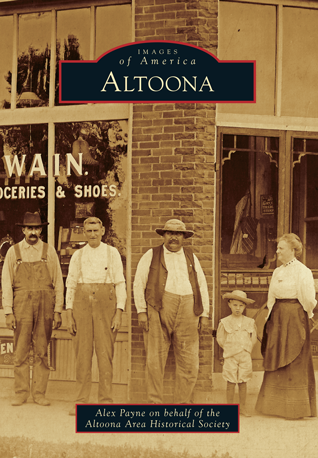 Alex Payne, the vice president of the Altoona Area Historical Society, and researchers Dawn Bentley and Karen Hanley have spent a multitude of hours digging through the historical society's archives and meeting with local residents to create Images of America: Altoona.